Mark's Tickets is the best place to find tickets for Pearl Jam fans. Just check this page for any new events or schedule updates throughout the year. We sell tickets to every Pearl Jam concert around the world. We know how passionate Pearl Jam fans can be about alternative music, so we make sure to have hundreds of tickets for every concert available right up until showtime. For those looking for cheap Pearl Jam tickets, we offer tickets starting at very low prices (many times below face value). We offer tickets in most sections of every venue that Pearl Jam performs. Simply choose the city or venue that you are interested in below, and you will be able to see all of the available seats. Do not forget that Marks Tickets also specializes in sold out Pearl Jam tickets. No longer will sold out shows prevent you from seeing Pearl Jam. Pearl Jam is an American rock band that formed in Seattle, Washington, in 1990. Since its inception, the band's line-up has included Eddie Vedder (vocals), Stone Gossard (guitar), Jeff Ament (bass), and Mike McCready (guitar). The band's fifth and current drummer is Matt Cameron, of Soundgarden, who has been with the band since 1998. Formed after the demise of Gossard and Ament's previous band, Mother Love Bone, Pearl Jam broke into the mainstream with its debut album, Ten, in 1991. One of the key bands of the grunge movement in the early 1990s, over the course of the band's career, its members became noted for their refusal to adhere to traditional music industry practices, including refusing to make music videos, giving interviews and engaging in a much-publicized boycott of Ticketmaster. In 2006, Rolling Stone described the band as having "spent much of the past decade deliberately tearing apart their own fame." To date, the band has sold over 31.5 million records in the U.S, and an estimated 60 million worldwide. 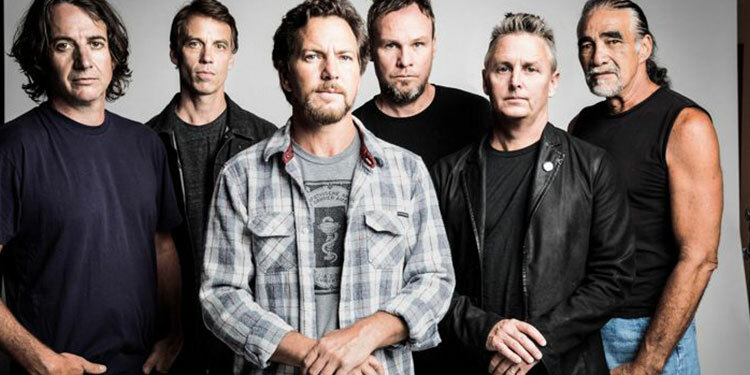 Pearl Jam has outlasted and outsold many of its contemporaries from the alternative rock breakthrough of the early 1990s, and is considered one of the most influential bands of the decade. Stephen Thomas Erlewine of Allmusic referred to Pearl Jam as "the most popular American rock & roll band of the '90s.